Some of my old friends and I went perch fishing out on Irondequoit Bay here in NY. We had lots of fun and laughs. Good friends and excellent perch fishing is hard to beat. We were out to put some meat in the freezer and we did just that taking about 200 perch... I can almost taste them now! 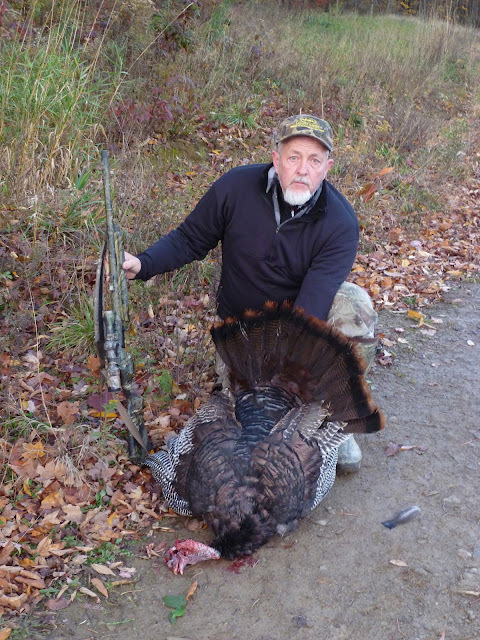 Yesterday was opening weekend for turkeys in NY and my buddy Ben and I both took birds. Ben shot his in the morning and I took mine in the afternoon... This was my only weekend to hunt with my knee surgery scheduled for October 30th. The doctor says I'll be down and out of hunting and fishing for about 4 weeks... Even so I am planning to hunt opening day of the gun deer season on Nov. 17th. Lucky for me the birds were working the fields and I could drive the four wheeler right near my blind. I've been looking for a long time for my first bamboo fly rod... I wanted a classic. Last week I purchased it and she came today. 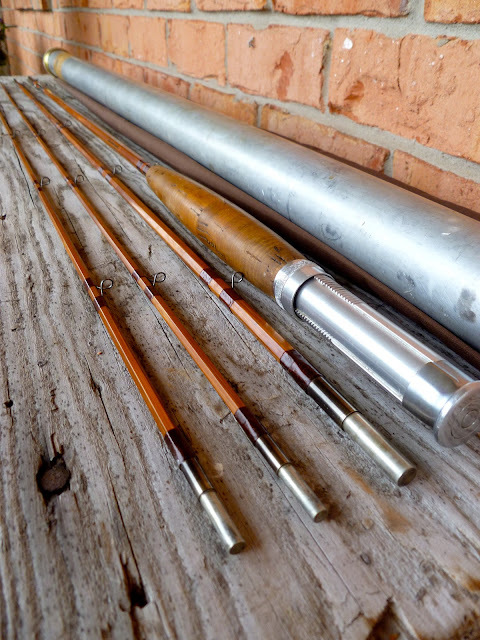 An original Orvis Impregnated Battenkill, 5 3/4 oz., 9 foot, 3/2 (3 piece with 2 tips), HCH or 7 wt., built in 1949 at the Orvis shop by John Rosencrantz. Just what I wanted and she's in excellent all original condition... perfect. I just came in from lawn casting it with a 6 weight line. The rod seems to like that line but more casting will be done to find just the right line weight for this fine rod, but oh she feels good. I bought it for the bigger waters of the Yellowstone, Gardiner and the Delaware Rivers to cast big flies and catch big fish, can't wait. My son Scott and I fished the Delaware River this weekend. We fished the Main Stem on Saturday and the West Branch on Sunday. This trip had a little bit of everything. Saturday it was cold and windy with rain on and off making for some difficult fishing with only a few bugs hatching. BWO's, Sulphers and some dark brown caddis were all that I saw in very small numbers and zero Isonychia's on this trip. Later in the evening, just before dark we were able to catch a few and lose a few on Wiese's Coachman Clacka Caddis and some dark brown Korn's Spent Wing Caddis flies. But the highlight of the day for me was seeing a bald eagle flying low, down the river towards us with a fish in it's talons. It landed on the bank right behind us and started tearing and eating it... very cool. Later in the day we watched a Heron as it hunted not 10 yards from Scott. It caught a mouse, killed it and then swallowed it whole... Seems everybody was on the hunt this weekend.